Why don’t more girls and young women opt for apprenticeships in well-paid, male-dominated industries like construction? The government’s annual celebration of apprenticeships, National Apprenticeship Week, starts on Monday, but, behind the fanfare, some of the statistics on gender make depressing reading. The latest available official figures, for 2016-17, show that only 620 females started apprenticeships in construction and the built environment, compared with more than 20,000 males. Emily Burridge, 22, climbs the ladder at the back of a concrete tanker, parked at Weeford Quarry in Staffordshire and peers down inside. Just by looking inside a concrete mixer, she has learned to tell by the way the liquid moves over its turning blades, whether a batch of specialist concrete has the properties it needs. “It’s going to sound sad, but it’s my passion, my newly-developed passion, I do love it,” she says. She has been in her post for less than a year as technical production manager for a string of 25 quarries, concrete and asphalt plants with aggregates giant Hanson. The person she replaced, after completing a higher level apprenticeship, was a man of retirement age. Her staff are overwhelmingly male and much, much older – but she says it has not been a problem. “As long as you’re honest about what you know and what you don’t, you show that you actually want to grow your knowledge, and that you appreciate their side of things, then they’re perfectly respectful and they acknowledge any feedback you give them,” she says. Quality control and complaint handling are a key part of the job but when, as a very young woman, she turns up on construction sites, she admits, people can be “taken aback”. Four years ago, graphic design was Emily’s favourite A-level subject but now, instead of palettes and pixels, she has her own set of personal protective equipment in hi-viz orange, including hard hat, goggles and steel toecap boots. In sixth form, she had realised a conventional university course was not for her and, while her friends were busily applying through admissions service Ucas, she was working in a pub near her home in Somerset. Some of Emily’s friends wondered if she would be there for ever. It was her grandad who suggested trying for a degree apprenticeship, where the employer pays your tuition fees and you earn a salary. But graphic design apprenticeships were hard to find, so she decided to widen her search. She says the recruitment process focused on resilience, resourcefulness and people skills. She was the first girl ever hired on the scheme and, two weeks after starting, she and a fellow apprentice were thrown into the deep end. They were asked to research and create a roller-compacted concrete for a customer – it is a drier mix than conventional concrete and something Hanson had never made before. Emily started her management job last year on a salary of £30,000, shortly before graduating from University of Derby with a foundation degree in mineral extractives, and she is currently working towards honours. It was a distance learning degree and so, apart from occasional short courses at the university, she spent four days a week in her job, with the fifth day studying on her own in an office. She likes to tease her boyfriend, a student on a conventional degree course, about the fact that, unlike him, she has no student debt. The Young Women’s Trust, which campaigns for disadvantaged young women, says many feel “locked out” of better-paid apprenticeships and funnelled down a narrow range of career paths, with gender stereotyping and fears of workplace bullying major deterrents against jobs in male-dominated industries. In contrast, Emily says her experiences have been positive and that, despite being one of only four females out of about 40 apprentices since the scheme began seven years ago, she has felt incredibly well-supported. Hanson’s head of recruitment, Helen Johnson, says hiring female apprentices is “a no brainer”. “Historically females were not told about opportunities in the construction and building materials industry as it was assumed only males would go into it. We need to change this. There is no reason why females cannot enter our industry,” says Ms Johnson. Deborah Edmondson, early talent and apprenticeships director with recruitment company Cohesion, believes things are slowly changing, and that “women are seeing increasing opportunities and challenges in a diverse and fast-paced sector”. Ms Edmondson believes hiring a more diverse workforce of people from varying economic and cultural backgrounds can only benefit employers. “Diversity within the workforce increases employee morale and teamwork, and increases innovation and innovative thinking, through alternative perspectives and ideas on the same issues,” she says. At 22, Emily feels there are no barriers to her future progress and can already list some career highlights. 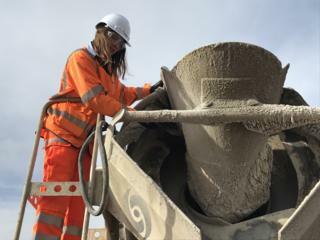 “I flew a drone to assess the size of stock piles of aggregates and I also drove a train, which was a big tick on the bucket list, and I loved it,” she says.